In this guest blog post, Dr James Bettley tells us about fascinating discoveries in Great Totham. In January 2013, the parishioners of Great Totham were clearing out the vestry at St Peter’s Church following a major reroofing project. From behind a large wardrobe emerged a painting of the church, not seen for as long as anyone could remember, although the view of the building was familiar from an engraving that had been used as the frontispiece to The History of Great Totham, published in 1831. 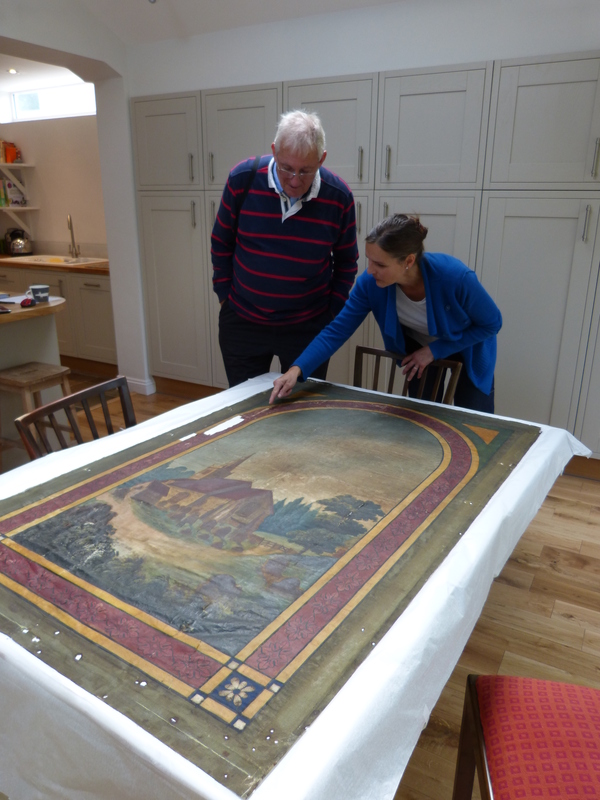 The painting was dirty, torn, and stained, but it is now being cleaned and repaired (thanks to grants from the Heritage Lottery Fund, Essex Heritage Trust, and the Church Buildings Council), and on Saturday 1 November it will take centre stage at a symposium being organised to celebrate the cultural life of Great Totham in the 1820s, ’30s and ’40s. The church, hall and vicarage were the heart of the village in those days. The vicar himself, G. S. Townley, spent most of his time in London (he was also rector of St Stephen Walbrook), so from 1810 the parish was looked after by a curate, Thomas Foote Gower; in 1829 Townley was declared of unsound mind, but did not die until 1835, when Gower succeeded him as vicar (and remained until his death in 1849). Gower was well connected. His father, also a clergyman as well as being a physician and antiquary, lived in Chelmsford and had married the sister of John Strutt M.P., the builder of Terling Place. 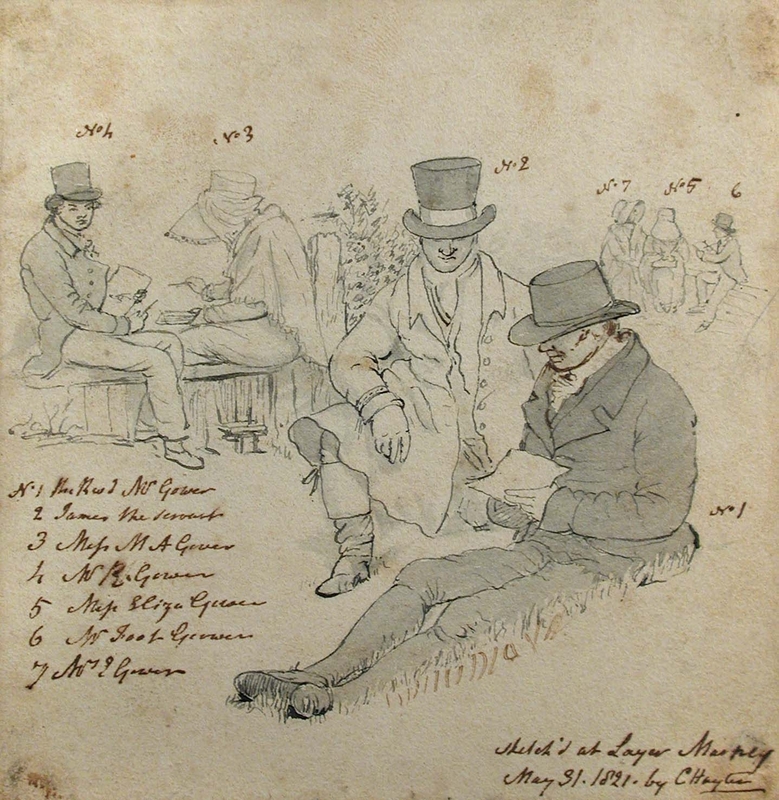 Gower moved in good circles, and it is not surprising that when the famous painter of portrait miniatures, Charles Hayter, was living for a few months in Witham in 1821, Hayter and Gower got together. The painting of Great Totham church is known to be by ‘Miss Hayter’, and there can be little doubt that this was Ann, Charles’s daughter, herself an accomplished and well-known miniature painter who exhibited at the Royal Academy between 1814 and 1830. Gower’s Totham friends included the two Johnson brothers, George William and Cuthbert William, and Charles Clark. Both the brothers were barristers, but both also achieved fame as writers, G. W. on gardening and C. W. on agriculture. G. W. also wrote The History of Great Totham, which was printed by Charles Clark – without doubt the most eccentric of the circle. Nominally a farmer (his father was the tenant of Great Totham Hall), he spent most of his time writing doggerel poetry, printing, and collecting books (his extraordinary letters to a London bookseller, John Russell Smith, are in the Essex Record Office: D/DU 668/1-20). The symposium on Saturday 1 November will explore the world of Clark, Gower, the Hayters, and the Johnsons, and will include talks, poetry readings, and a demonstration of printing on something like the press that Clark used. The event runs from 2.30 to about 6.00. Admission is free, although there will be a charge for tea. For further information, please go to http://totham1821.wordpress.com/, or email jamesbettley@btinternet.com.